Today we have a Guest Post about Bar Sinks. To read my post Fun Bar Sinks that I wrote in February go here. For those who live to entertain, a wet bar and bar sink are a sure bet to take your home to the next level and make it the perfect venue for an incredible evening with your guests. And the best part is, with a well decorated wet bar awaiting you in your basement, you don’t even need extravagant, high-priced luxury real estate in a picturesque Connecticut town (or some other state in New England) to have guests flocking to your new home hot spot. Just gather up some fun guests, tasty drinks and your wet bar will be filled with smiles and your bar sink with empty glasses in no time (when you throw a party at home, the only DD you need is a designated dishwasher). Before we go too far, you may be wondering why have a wet bar? Well, if being the beloved host isn’t enough, some of your hobbies may really benefit from having a wet bar. If you’re already a home brewer or want to learn to be a better home brewer or are into wine making at home, then having a wet bar to serve your drinks is only logical (just make sure you have a wine chiller, too). If you’ve already devoted a lot to making your basement a great hangout spot, adding drink serving capabilities can kick it up a notch or three. Building a wet bar at home can also be a fun do-it-yourself project with your friends and family that can yield lots of quality bonding time and create some great memories. Lastly, building a wet bar with a cool bar sink can increase the value of your home if you ever decide to put it on the market. So now that we have you motivated to get going on your own home wet bar, it’s time to talk about the bar sink that will accompany it. Earlier this year, we wrote about Fun Bar Sinks, and while previously these cornerstones of granite greatness may have been relegated to "just get it done" status, you now know there are some cool bar sinks out there that may have you thinking twice for what deserves a place at your wet bar. In this edition, we’re back with more cool wet bar sinks, as well as some sinks for those who want a more traditional or classic look to their wet bar. 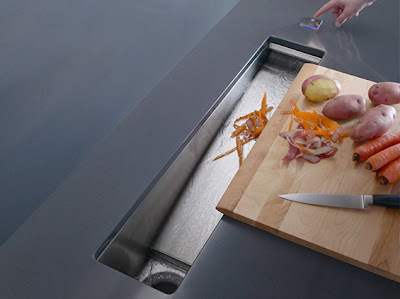 This prep sink is great not just for a wet bar, but for any kitchen prep work. The beauty of this stainless steel sink from Kohler is its ability to quickly and easily get rid of waste with the touch of a button. Simply press the button on top and watch your waste slide right into the garbage disposal. So whether you’re cutting up some citrus for a drink or veggies for a dip, you can get right back to the party, make clean up and disposal a breeze, and impress your guests with the touch of a button. This art deco inspired urban chic bar sink from Houzer is the ideal sink for the tasteful minimalist who demands a contemporary design. Made of stainless steel and with a lifetime warranty, this sink is perfect for those who want a contemporary look to their wet bar. This bar sink from Bates and Bates defines a classic and luxurious feel with its elegance. The Hammertone pattern and wide variety of materials that it is manufactured in, from copper and bronze to nickel and silver, means there is a choice for everyone. The impression it will make on your guests combined with its quality and durability will make you glad you splurged for this beauty. Whether you use it as a bar sink or a prep sink, this highly functional and innovatively designed bar sink from Elkay is a highly functional sink you will enjoy using. With its convenient placement of a cutting board and charming aesthetic, you’ll be sure to use this sink as often as you can. Be prepared for a lot of positive comments from your guests about this sink at your wet bar. As we get closer to your traditional sink, we bring you this extremely durable bar sink from Blanco. The black finish on this granite bar sink gives it a striking look from afar, but as we get up close, its hygienic qualities allow it to resist absorbing odors and bacteria and give it a unique stone feel resistant to scratches and stains. A classic look with a modern twist, super durability, and cleanliness make this bar sink a great choice for your home wet bar. This is the ultimate classic bar sink from Moen. Its simple stainless steel finish and overall design make this no frills approach perfect for those on a budget but still want the kind of quality Moen is known for. So those are our list of cool new bar sinks for your home wet bar. What did you think? Please leave your comments below, and if you enjoyed this article, share it with your friends and family on Facebook, Twitter, or any other sites you use, we’d really appreciate it. BIO: Daniel Rosenhaus writes for AERO Manufacturing a leading manufacturer of industrial and commercial grade stainless steel sinks. <="" a="" href="http://www.aeromfg.com%3estainless%20steel%20sinks/">. However, he always likes to keep up on the fun side of remodeling for his home and has just recently finished his new home wet bar and looks forward to entertaining guests in his kitchen and not in a showroom.